Being accepted into the Social Security Administration’s Disability program is complicated and the odds are not in your favor, even if you have an obvious and severe physical or psychological disability that keeps you from working at your full capacity. According to the Social Security Administration, during the 10-year period from 2001 through 2010, only 28 percent of initial claims were awarded benefits. 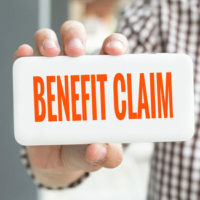 Three percent were awarded benefits during the reconsideration step, and 13 percent were awarded benefits during the hearing level of the process. That leaves 53 percent of Social Security disability applicants having been denied outright. This is why working with an attorney is so vital to your success. There are many reasons for benefit denial by the Administration: medical, income, living arrangement, resources, and more. The important thing to keep in mind is that you have options after being denied. There is still a good chance that you can be accepted into the program. There are four levels of appealing a denied disability claim, described below, according to the Social Security Administration. During the reconsideration period, your claim will be reviewed by a Social Security Administration staff member who was not a part of the initial decision. All of the same evidence submitted by you, and additional evidence if possible, will be analyzed. You do not need to be present during a reconsideration. Upon denial of your reconsideration, the next step to take is to ask for a hearing. Again, a person that was not involved in the original decision or reconsideration will look at your claim. This person will be an administrative law judge. You must be present during this hearing, or be present via video conference, and will be asked to provide additional information (before the hearing) to help explain to the Administration why your claim should be accepted for benefits. The Social Security Administration’s Appeals Council is the third step when it comes to denial of benefits if the hearing judge still agrees with the initial decision. However, the Appeals Council will not even agree to review your claim if it agrees that the judge’s hearing decision was correct. During review, however, the Council will defer to an administrative law judge, or review your claim itself. The fourth step you can take is to file a lawsuit in federal district court. In this scenario, and any of the three previous levels, it is in your best interest to work closely with an experienced Social Security Administration attorney. Filing for Social Security disability is no easy task, and is made all the more complicated when you do not work with an experienced attorney. We strongly encourage you to talk with one of our White Plains lawyers today with the Law Office of Michael Lawrence Varon. Call us today for a free consultation.